Thanksgiving is a contested holiday. Enjoy it anyway. In England, along time ago, there were people called Pilgrims who were very strict about making everyone observe the Sabbath and cooked food without any flavor and that sort of thing, and they decided to go to America, where they could enjoy Freedom to Nag. The other people in England said, "Glad to see the back of them." In America, the Pilgrims tried farming, but they couldn't get much done because they were always putting their best farmers in the stocks for crimes like Suspicion of Cheerfulness. The Indians took pity on the Pilgrims and helped them with their farming, even though the Indians thought that the Pilgrims were about as much fun as teenage circumcision. The Pilgrims were so grateful that at the end of their first year in America they invited the Indians over for a Thanksgiving meal. The Indians, having had some experience with Pilgrim cuisine during the year, took the precaution of taking along one dish of their own. They brought a dish that their ancestors had learned from none other than Christopher Columbus, who was known to the Indians as "the big Italian fellow." The dish was spaghetti carbonara--made with pancetta bacon and fontina and the best imported prosciutto. The Pilgrims hated it. They said it was "heretically tasty" and "the work of the devil" and "the sort of thing foreigners eat." The Indians were so disgusted that on the way back to their village after dinner one of them made a remark about the Pilgrims that was repeated down through the years and unfortunately caused confusion among historians about the first Thanksgiving meal. He said, "What a bunch of turkeys!" Nathaniel Hawthorne, who came along a couple of centuries later, bears some of the blame for the most repeated of the answers: that Puritans were self-righteous and authoritarian, bent on making everyone conform to a rigid set of rules and ostracizing everyone who disagreed with them. The colonists Hawthorne depicted in “The Scarlet Letter” lacked the human sympathies or “heart” he valued so highly. Over the years, Americans have added to Hawthorne’s unfriendly portrait with references to witch-hunting and harsh treatment of Native Americans. Contrary to Hawthorne’s assertions of self-righteousness, the colonists hungered to recreate the ethics of love and mutual obligation spelled out in the New Testament. Church members pledged to respect the common good and to care for one another. Celebrating the liberty they had gained by coming to the New World, they echoed St. Paul’s assertion that true liberty was inseparable from the obligation to serve others. Ah, but here's another point of controversy: did this notion of an "obligation to serve others" manifest itself in a kind of pre-Marxian "socialism" that, as argued by some "conservative"* writers in recent years, led to indolence and crop failure which was alleviated by a decision to allow individuals or families to own and farm private property, thereby giving them the incentive to produce more and leading to the bumper crop that was the basis for the first Thanksgiving feast? The British historian Godfrey Hodgson observes of this argument, in his article "Thanksgiving and the Tea Party" in openDemocracy, that "there is a certain historical basis for it." When the settlers had first arrived at Plymouth, all their slender property was held in common, and food distributed to each according to his need. In spring 1623, they decided to allow each family to grow its own food on its own plot. [Edward] Winslow [one of the settlers who arrived on the Mayflower] describes the motive thus: “considering that self-love, wherewith every man, in a measure more or less, loveth and preferreth his own good before his neighbour’s, and also the base disposition of some drones”. ...[A]ll of them, godly or profane, were engaged in a capitalist enterprise. They had borrowed money for the expedition from financiers who would have to be repaid. Their agreement over sharing land and property was the internal arrangement of a company of adventurers, of whom there were many such in 16th and 17th century England; this one just happened to include men and women with religious convictions. A drought causes the crop planted by the settlers - corn and beans - to fail. They respond by humbling themselves before the Lord in prayer and fasting. “Oh, the mercy of our God”, Winslow writes, “the clouds gathered together on all sides, and the next morning distilled such soft, sweet and moderate showers of rain” that the corn and the beans revived. The settlers thank their God for His mercy. This comports with the notion of the motive for the first Thanksgiving: gratitude to God for a good harvest. It also fits with the "Tea Party" account chronologically, since the "common course" of property holding was abolished by Bradford in the spring of 1623. Nevertheless, it doesn't support the notion that a newfound industriousness on the part of the settlers caused a bumper crop; instead, it was a change in the weather that the settlers ascribed to their pious supplications to God. Bradford’s account [is] of a feast in 1621 - a sort of frontier diplomatic dinner - between the people Bradford later called “Pilgrims” and the local “Indian” tribe and their “king”, Massasoit. Bradford describes how the colonists sent four men out to hunt, who returned with a large quantity of “fowl” (not necessarily turkeys); and how the Indians contributed the carcasses of five deer. That event is widely remembered as the First Thanksgiving (see [Hodgson's] A Great and Godly Adventure: The Pilgrims and the Myth of the First Thanksgiving [PublicAffairs, 2007]). Randy Patrick, in "The Myth of the First Thanksgiving," relying on Hodgson's A Great and Godly Adventure, notes that the Native Americans were party crashers, not invited guests. When about 100 Wampanoag warriors showed up uninvited at the Pilgrims’ festival with freshly killed deer as a gesture of goodwill, they were angling for a treaty with the Anglo-Saxon tribe. In the first place, Hodgson says, the Separatists (they weren’t called Pilgrims) showed their gratitude to God not by feasting, but by fasting. Being radical Protestants, they didn’t celebrate holy days (i.e. holidays) such as Christmas and Easter, because they considered them superstitious relics of Catholicism. Being English, however, they did celebrate the secular Medieval harvest festival, which involved eating, drinking beer and wine, and playing games. However, Patrick disputes Hodgson's contention that turkey was not likely to have been on the menu because they were scarce in the vicinity of Plymouth. He cites Nathaniel Philbrick's Mayflower (2006), which quotes Bradford to the effect that wild turkeys were abundant in the area, and that the settlers hunted them in winter when they could track them in the snow. One thing’s for sure: If the Pilgrims did encounter a turkey, they would know what it was because the Spanish had introduced the American species to Europe by way of the Ottoman Empire (thus the name “Turkey”) in the time of the conquistadors. By the 1620s, it was a familiar dish on the English table. 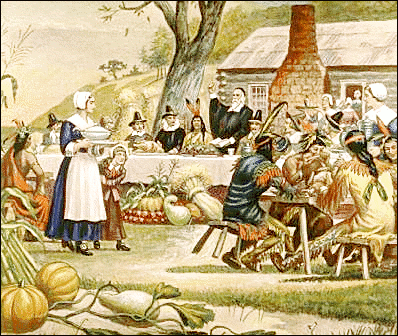 As for the pumpkin pie and cranberry sauce, Hodgson says, the English colonists didn’t have sugar until decades later. So, what can we conclude from all this? Attempts to use history to prove gastronomic, political, or religious contentions must always be examined carefully. Meanwhile, enjoy your turkey with all the trimmings. * I've put "conservative" in quotes for the reasons given in the first footnote to this post. In particular, I think that advocates of largely unregulated "free markets" are anti-conservative, if "conservative" is understood to mean protective of a stable social order, as untrammeled markets are erosive of such stability. College football update: Harvard wins The Game, but not the Ivy; Sunshine State stays in top 25. Once again, I missed The Game. Only effete Eastern liberal elitists like me call it The Game. (Wait a minute: I've usually thought of Florida/FSU as The Game. * Oh, well; please don't tell any of my friends in The New England Society in the City of Brooklyn.) I was tempted by an e-mailed invitation to watch it at the Harvard Club of New York City, and thought of going there, drinking beer, and live blogging it on my BlackBerry just as I did the Florida/Georgia game from the Tapper Pub in South-by-God Tampa last year. But this pleasant prospect was chilled by the vision of some broomstick-up-the-arse type coming to me and saying, "Excuse me, sir, but the use of personal communication devices on Club premises is prohibited." Anyway, this year's version of The Game wasn't quite the cliffhanger last year's was. The first half was all Yale, but after the bands did their thing, ol' Mo (as the pundits love to say), perhaps having liked Harvard's halftime show better, went over to the Crimson side and stayed there until the final score was Harvard 28, Yale 21. While this will leave Cantab fans happy with the season as a whole, Harvard failed to win the Ivy crown many pundits had predicted it would. Thomas Kaplan of the Times proved prescient in picking Penn. Meanwhile, in the world of what most of you call real college football, Miami got thrashed by Virginia Tech, and was thereby banished from the AP top 25 for the second time this year. But Florida State's drubbing of Maryland put them back in the rankings at 22nd, thereby confirming my theory that it's become a fundamental law of nature, on par with f=ma, or Bristol Palin is a lousy dancer who nevertheless gets lots of votes, that at least one team from the State of Florida must be in the top 25 at all times. My USF Bulls had their usual troubles with Pitt, and next week face the humiliated Hurricanes. I fear it won't be pretty; nevertheless, USF is assured of a winning season under new coach Skip Holtz. Can anyone beat Boise State? I'm rooting for Nevada. *By Florida standards, this marks me as hopelessly nouveau. If I were really old school, Florida/Georgia would be The Game. Music that I hear while traveling often gets deeply engraved in my memory. In October of 1970, taking my first vacation from my first full-time job as an associate at a New York City law firm, I went to visit some law school friends in California. Heading west on a United Airlines DC-8 to Los Angeles, I listened to the "contemporary" track on the plane's sound system. I hadn't been listening to radio much over the preceding few months, so the songs I heard were mostly new to me. Among them were "I'll Be There" by the Jackson Five, "Lola" by the Kinks, "Green Eyed Lady" by Sugar Loaf, "Smoke on the Water" by Deep Purple, and "All Right Now" by Free. The last, by a band I hadn't heard of before, impressed me with its pounding beat and compelling vocal. Free was a relatively short-lived but influential British band. Initially a blues group, their music evolved into the straight ahead hard rock style exemplified by "All Right Now", which became a big hit and made their album Fire and Water sell well. Despite their success, Free disbanded in 1971, largely because of the drug problems of lead guitarist Paul Kosoff, who would die on March 19, 1976 (my thirtieth birthday) while on a flight from L.A. to New York, the opposite direction from that in which I was going when I first heard "All Right Now". Free's lead singer Paul Rodgers and drummer Simon Kirke later became part of Bad Company. The clip above is courtesy of frozenfish91, whose home page on YouTube features a clip of Paul Kosoff playing guitar on an instrumental piece called "Time Away", which he did with the group Back Street Crawler after leaving Free. It is accompanied by a series of still photos and short videos documenting Paul's life and career.